First Nationwide Atheism Campaign Launches In Washington DC - Joe.My.God. The above ad campaign from the American Humanist Association kicks off on DC’s transit system this week and expands to bus and subway systems in New York, LA, SF, and Chicago next week. 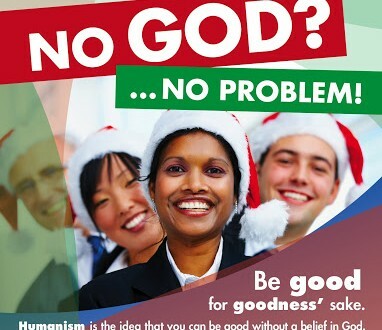 This is the first ever nationwide campaign promoting atheism in America. 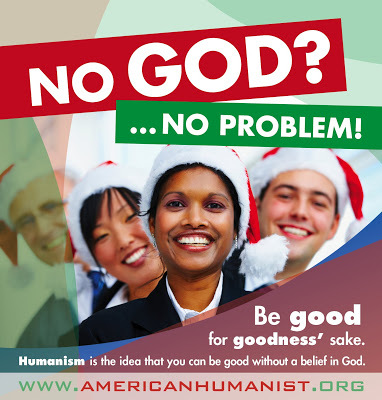 Roy Speckhardt, executive director of the American Humanist Association, explained, “We’re hoping this campaign will build awareness about the humanist movement and our ethical life philosophy–particularly among the ‘nones:’ the rapidly growing percentage of people who claim no religion.” Since 2005, humanist advertising has become increasingly visible, in particular with highway billboards erected in major cities across the United States. And last year, the American Humanist Association sparked national controversy by advertising the slogan “Why Believe in a God? Just be Good for Goodness’ Sake,” which appeared on Washington, D.C. Metro buses.